Treating androgenetic alopecia—male and female pattern baldness—with permanent results is the holy grail of hair loss treatments. Unfortunately, a permanent solution to this all-too-common ailment remains elusive, but existing and emerging treatments are capable of managing hair loss more effectively than ever before. At Carolina Hair Center, Dr. Cooley and our team of hair loss professionals want to help you target hair loss with the latest in medical solutions. Platelet-rich plasma (PRP) therapy has grown in popularity in recent years as a successful treatment for genetic hair loss and we are proud to offer it at our clinic. PRP therapy uses injections of a nutrient-dense serum to jumpstart hair growth and reinvigorate dormant follicles. At the start of a PRP for hair loss treatment, a small amount of your blood is drawn and then put in a centrifuge. The centrifuge helps separate the plasma from the blood cells, creating a concentrated solution full of growth factors. Using precise injections, Dr. Cooley will then administer the PRP to the thinning and balding areas of the scalp, where it will go to work reactivating aging follicles and promoting hair growth in the treated area. PRP works by targeting follicles that are inactive and that have begun to cease production. Aging and genetics are two key factors that play into hair loss and can cause follicles to become stuck in the resting phase of their natural growth cycle. With a direct infusion of growth factors and nutrients from PRP, follicles that have slowed down their growth or have stopped producing hair altogether are rejuvenated and begin growing thicker, denser hair. PRP therapy is relatively new to the hair loss scene and research into its efficacy remains underway. According to the most recent studies, an estimated 70 percent of patients experience optimal results following PRP for hair loss treatments. New hair growth may be evident in as few as one session, but most patients benefit best from a series of injections scheduled during a three- to four-month period, followed by routine maintenance appointments scheduled regularly throughout the year. While PRP injections on their own can show favorable results for the majority of patients, they work best as one part of a broader approach to hair loss. In order to truly experience lasting results, patients should also take advantage of effective hair loss medication like Rogaine and Propecia, upon a doctor’s recommendation. At Carolina Hair Center, we will work with you to determine the best treatment plan using all available FDA-approved treatment options. We believe that the solution for hair loss lies in a comprehensive approach and will offer all of the resources you need to restore a youthful head of hair. 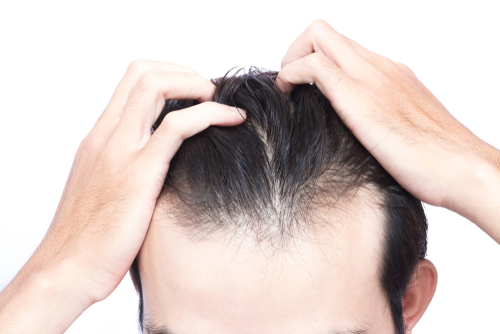 If you are interested in a long-lasting hair loss solution, then hair transplants may be the answer. At Carolina Hair Center, we offer hair transplantation surgery using both the follicular unit extraction (FUE) and follicular unit transplantation (FUT) methods in order to provide options for patients with varying needs. We regularly combine PRP injections with hair transplant surgery to accelerate new hair growth in transplanted follicles or to increase hair density in donor sites prior to the procedure. PRP for hair loss treatments offer a versatile and minimally invasive option for patients suffering from androgenetic alopecia. If you would like to learn more about PRP therapy or any of our other hair loss solutions, then call Carolina Hair Center today at 704-542-1601 to schedule a consultation with Dr. Cooley.